The Ten of Cups represents not only physical well being, but also psychological stability and spiritual advancement. 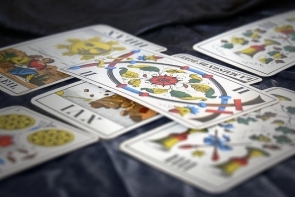 In a tarot spread, it foretells not just material success but intellectual triumphs and the attainment of spiritual wealth. The Ten of Cups or the Lord of Satiety card radiates love and beauty. It indicates that the subject is blissfully satisfied and contented with his work and home environment. What else can an ordinary human being aspire for? 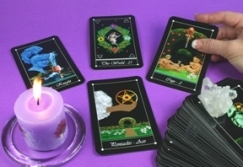 If this card appears it means that your life is on the right track. It is orderly and fulfilling. It is unfolding the way you want it. Everything is at its proper place. You should enjoy this state of bliss with a spirit of gratitude. 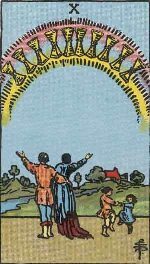 This card also indicates that the subject is enjoying a sense of close harmony with the Higher Powers after a long tussle with the ups and downs of life. You are in touch with the energy flow occurring in an unending stream. But do not take this flow for granted and be careful not to look for problems that might block it.